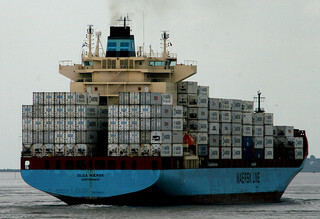 The world’s three largest shipping companies are planning to move ahead with their proposed alliance. They also expect approval by the three governing bodies assessing the situation by late into the second quarter of this year. Denmark’s Maersk Line, France’s CMA CGM, and Switzerland’s Mediterranean Shipping Co. (MCS) are organizing a separate company, which will act as a mediator to combine resources and shipments between the three shipping giants. This organization will do no marketing of its own, thereby avoiding much of the problems governing agencies might have with the proposed alliance. The P3 alliance is perhaps an indication of a broader trend in the shipping industry, spawned in response to the difficult problems the industry has faced since the economic meltdown in 2008. Capacity overages, fuel costs, and other issues have tanked profits for most shipping companies. The U.S. Federal Maritime Commission, the European Union’s Competition Commission, and the transport ministry of China met in December to discuss the alliance. Following the summit, Lars Jenson (expected to act as CEO of the P3 organization) was confident that the alliance would be allowed to move forward. Other industries affected by the alliance, including fuel companies and smaller shipping companies, have expressed concern about the alliance. Fuel companies are worried that they will not be able to negotiate fuel prices with the three shippers on an individual basis, and smaller shipping companies are concerned about the massive market share the alliance will hold. Following the formation of the alliance, the P3 will control approximately 43 percent of the Asia-to-Europe container shipping market, 41 percent of the trans-Atlantic market, and 24 percent of the trans-Pacific market. The organizational set up of the P3 alliance is supposed to alleviate concerns that this conglomeration is a merger. P3 participants would share ships and ports, allowing them to maximize services and capacities, but would market and operate their companies entirely separately, continuing to compete in all other respects.